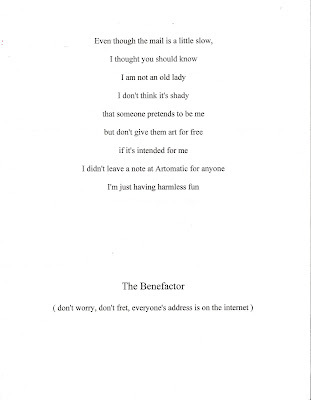 The last "benefactor claimant asserted that he/she had mailed out 50 letters to AOM artists. If you got one, either drop me an email or leave a comment. Wanted to give a shout out to some artists whose work I have really enjoyed this year. I hate to call it a Top Ten...mostly because I have others I really like. These folks, however, took the time to "talk" with me (via interviews on my blog), so I know them better and appreciate their work even more. Patricia Hartnett: there is an underlying magic to the small paintings of a girl and a bird (birds), the twig tree - all things that call me in to visit with the work and hear it's stories. There are secrets here and I want to spend time learning them. Tracey Clarke: also weaves a mythological land for her work. "The Guardian" caught my eye, the LLama with butterflies (whose title I don't know) kept me there delightedly smiling. I could live with any of her work forever (pretty much my criteria for "great art"). Krissy Downing - and not the first time. Her whimsical sense of humor always makes me smile. But this year, she added "Child in Branches"...not whimsical. More melancholy. Wonderful! Alex Zealand - because I never quite know what it is I'm looking at. This year's piece was first rain, then harp strings, then a flock of birds. Doesn't get boring! Jane Braoaddus - because her dolls are slightly wicked, and call forth the dark side. I like that (not to mention wonderfully and imaginatively executed). Sofya Mervis: more dark side, pursuing a quest I visit in Body Politics: what is real beauty? why do women allow themselves to be co-opted by a marketing media that does not have their best interests in mind as it totes that "perfect" look? Pretty much: when will we (women) learn? Susan LaMont - color. Lots of lush color. And underlying all that color, some tale is being told by juxtaposition of light and shadow. Mesmerizing! Kim Reyes - always shows something that absolutely captures me. More often than not, several somethings. This year she has returned to her necklaces with ceramic focal pieces - the work that first caught my eye at AOM02. And Departing (ceramic and chicken bones) stopped me in my tracks. Reminescent of her work last year, it has to be a personal story, but there wasn't a tour for me learn the back history on it - my loss. (I don't have an interview with her but I have known and loved her work since my first ArtOMatic so I'd be remiss if I didn't mention her). John Grunwell because I fell in love with his cat portrait at AOM02 and have enjoyed watching his style emerge and develop. David Alfuth - His work amazes me. And he really really worked with me to get an interview in for my blog (computer troubles). I guess you have to have infinite patience as a characteristic to make his creations! And like I said, there are many many more pieces I could cite and artists I could name. What I like about ArtOMatic lately is that one can watch certain artists as they move forward in their artistic process. Fascinating to watch unfold, inspiring to see their tenacious movement toward unrealized vision that is revealing itself as they go.